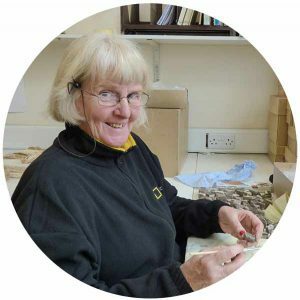 Sue began volunteering with us at our Kemble office in 2013. she started out by washing skeletons from the large cemetery site in Gloucester, before being employed part-time two years later as a Post-Excavation Processor. After ten months, Sue left us temporarily due to other time commitments, but recently re-joined us in February 2017. Before retirement, Sue worked in accounts and she has also had a strong interest in agriculture and veterinary practices. Sue has also been a member of Gloucester Archaeology, a society interested in the archaeology and history of Gloucestershire, for six years. Sue says “I find the work, and the challenges it provides, rewarding. I find I am continually learning each time I come into the office. I have always enjoyed the tasks and working with fellow volunteers and Cotswold Archaeology employees”. In Sue’s spare time she likes to garden, hill walk in cold locations and help her neighbours tend their farms.